In the days and in the culture in which Jesus lived and ministered, women were considered inferior to men in nearly every way. Jesus didn't see it this way, and the gospels are filled with examples of amazing women who gained the admiration and respect of our Lord. 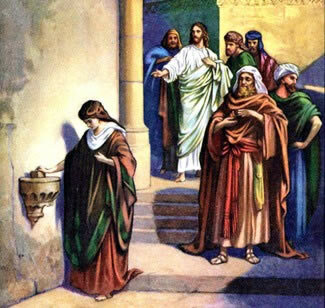 One such lady was Mary of Bethany, with her famous "alabaster flask" containing expensive, fragrant oil. From a previous account of Mary and Martha, we discover that of the two sisters, Mary was the quintessential worshiper. Martha's willingness to cook for the Master and serve the disciples was no doubt appreciated, but Mary's desire to be close to Jesus and drink in His words was better still. "Mary has chosen that good part…" said Jesus. The fragrant oil, or perfume Mary brought to Jesus in her alabaster flask was worth "300 denarii." This is equivalent to somewhere around thirty thousand dollars in today's money. No common person of those days would have such incredibly expensive perfume lying around the house. Indeed most Jews would never have even seen such a rare and valuable substance. It would seem that Lazarus, Mary, and Martha were a family of no small means. In all likelihood they were major supporters of Jesus' ministry. Jesus loved this family, and enjoyed frequent times of fellowship with them. When the sisters sent to Jesus to come and heal their brother Lazarus, they wrote, "He whom You love is sick." Mary's "very costly oil of spikenard" was not something you would splash on daily, just before going to the marketplace. It would have been reserved for very rare and special circumstances, and then used sparingly. It was sold and kept in alabaster containers. Alabaster was a stone commonly found in Israel, although primarily mined in other countries. Alabaster flasks were the forerunners of our modern perfume bottles. These flasks were usually small and had an opening that could be sealed with wax. When sealed these stone flasks held the perfume's aroma completely, but when opened the aroma would soon become evident – the more concentrated the oil, the stronger the fragrance. It was with this, her thirty thousand dollar bottle of perfume, that Mary approached the Lord Jesus. Actually this was far more than your typical small or medium sized bottle of perfume. I have some essential oils which I sometimes burn in an oil burner to make the house smell nice, and they come in a 25 milliliter size, which is less than one ounce. Mary's stone flask contained a pound of pure spikenard. Both the amount and the quality of this fragrant oil were exceptional. Mary did not bother to unseal the flask. Perhaps she was fearful the disciples or even Jesus would try to talk her out of it. She was determined to accomplish that which pressed so strongly upon her heart. 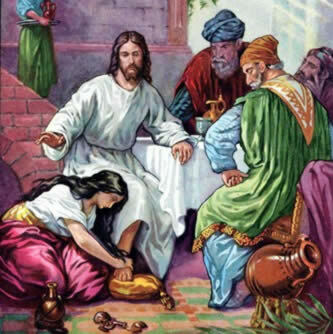 She broke the flask, destroying any hope of preserving it for any further use, and poured it on the feet of Jesus. It was a lavish, extravagant act. Thirty thousand dollars worth of one of the most expensive perfumes on the market was instantly poured out in a one-time use that could never be retracted. The room, indeed the entire house, was instantly filled with the sweet smelling fragrance. Judas Iscariot spoke up first, demanding indignantly, "Why was this fragrant oil not sold for three hundred denarii and given to the poor?" John tells us that Judas' motives were not quite as altruistic as they sounded, noting that Judas was a thief and used to help himself to the group's money. Still, one can see the logic of Judas' reasoning. On the surface Mary's act appears to be entirely wasteful. The money that the oil represented could have done significant good, either for the poor, or to help finance the disciples in future missions. Sure, the smell was nice, but it would soon go, and then what would be left? Jesus did not consider Mary's act a waste, and defended her, saying, "Let her alone; she has kept this for the day of My burial. For the poor you have with you always, but Me you do not have always" (John 12:7,8). Jesus had been warning His disciples that the day of His death was approaching, and apparently Mary was the only one who had taken Him seriously. For Judas the act was wasteful but for Jesus it was worship. The devotion in Mary's heart and her willingness to give her best to the Master was in Jesus' eyes far more valuable than the actual oil or the aroma it produced. The Israelites were far too religious to offer God nothing; yet they were far too cheap to give Him their best. So they searched through their flocks for the weakest, poorest specimens they could find, the animals that would have brought them the least profit, and these became their sacrifices. This was the exact opposite of Mary – these gave their worst while Mary gave her best. Mary set the standard for devotion to Christ for all Christians of all ages. He who loves much gives much, and Mary gave her most expensive possession. She was not ashamed or afraid to "waste" herself and her possessions on her Lord. She was criticized for her actions by one who could not possibly understand her intense love for and devotion to Jesus. So it will be for us today. The idea of spending ourselves totally in the service of Jesus will seem wasteful and foolish to those whose hearts do not blaze with love for Him. There have been many men and women who have followed Mary's example. One of my favorites is the British evangelist George Whitefield, who ministered in the 1700's. As a young man Whitefield attended Cambridge University and fell in with John and Charles Wesley, and their "holy club" friends. Whitefield was born again and began preaching Christ to whoever would listen. And did they ever listen! Thousands and tens of thousands came out to the fields to hear the young preacher eloquently proclaim the riches of Jesus Christ. Whitefield's flaming, Holy Spirit-filled ministry soon touched all England, and eventually America as well. It has been estimated that he was personally heard by half the entire white population in America, as a result of his many ministry trips there. Whitefield's preaching schedule was exhausting. He would often preach five or six times a day. When traveling in America, he would preach at the top of his lungs to make himself heard to his audiences of thousands, and often spit up blood after the sermon was over. In his latter years, this took a tremendous toll on his health, and sometimes he became so fatigued that he was forced to remain in bed for weeks. Finally his strength would return and he would be off on his horse for another town, and another series of meetings. By the time he was in his fifties he was almost entirely worn out, and looked like an old man. He died at the relatively young age of fifty-seven, his body consumed by years of pushing himself to the brink of exhaustion. Many would suggest that his zeal went to the point of excess, but still one can't help but admire the way he gave himself entirely for the cause of Christ. And the fruit born through his life of total abandonment to Christ was astonishing. Whitefield touched more lives and brought more people to Jesus through his short fifty-seven years than most men or women could in a thousand years. In the manner of Mary of Bethany, he "wasted" himself on his Lord. The apostle Paul was a brilliant man with enough energy and drive for ten men. He could have succeeded in almost any field he chose. Before meeting Christ he seemed on the fast track to becoming the preeminent rabbinical scholar in Israel. As such he would have had the respect of all, and could have enjoyed a comfortable life of prosperity and privilege. But after his dramatic encounter with Jesus of Nazareth, Paul threw away any and all chances at a prosperous, comfortable life, and became a lowly preacher, chased from town to town, persecuted and vilified, and eventually killed for his unyielding stand for Jesus, the Messiah of the Jews and the Savior of the world. Actually it is not quite accurate to say that this widow gave her best; the truth is, she gave her all. It wouldn’t have been very impressive to anyone but Jesus, to see this poor lady drop her two little coins into the offering box. But Jesus looks not so much on the amount of our gifts, but on the devotion of our hearts. He saw here what He also had observed with Mary’s ointment – waste: a splendid, honorable, beautiful waste that was not really waste at all; it was love springing from “a pure heart, a good conscience, and sincere faith” (1 Timothy 1:5). Today, Jesus still looks for people like Mary and this unnamed poor widow, who are willing to “waste” their lives, their money, their talent, their time, and everything they have on Him and His glorious cause. In the end they will discover that nothing is truly wasted when giving all to do the will and works of the Savior. All is carefully saved, stored, and sealed for that Day. Like Paul, such believers can say, "I know whom I have believed and am persuaded that He is able to keep what I have committed to Him until that Day" (2 Timothy 1:12). 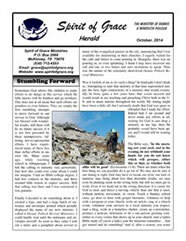 To see a full listing of all articles available, go to our Written Devos Page. 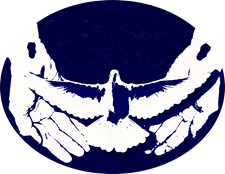 For a full listing of all articles as audio mp3 files (free downloads), go to our Audio Devos Page.